Couples heading to Chobe National Park will be able to find accommodations and pick modes of travel to suit all tastes and budgets, not have to worry about single supplements, and always have someone to share that marvellous elephant encounter when an entire herd crossed the road ahead of you, bulls trumpeting and matriarchs encircling the baggy-skinned babies… Whether on a top-end cruise or camping independently, couples can seek out the creatures and experiences that make them happiest. And certain adventures are made for two, like mokoro rides, although you’ll have to go to the Selinda concessions for that! 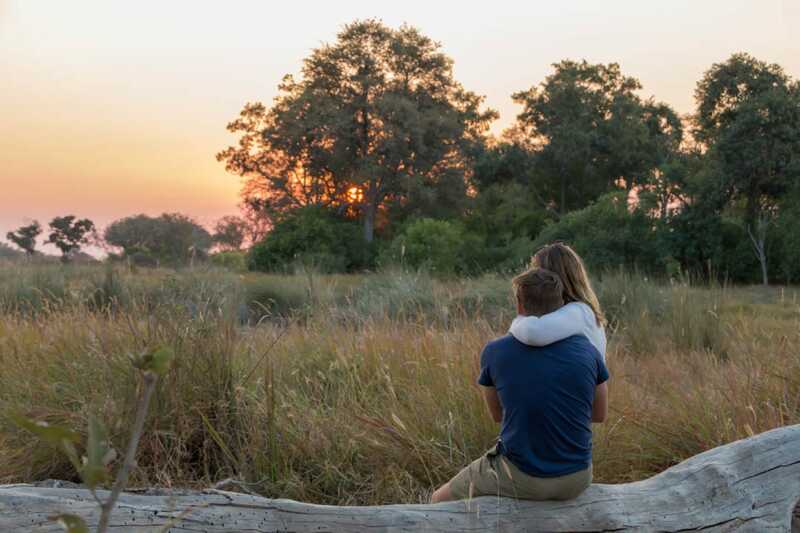 Many couples come to Chobe National park to mark an exceptional occasion: a honeymoon, an anniversary, or a romantic retreat. Privacy and luxury can be as important as the quality of the game viewing, and this may also influence the decision-making. First-time safari goers and honeymooners will enjoy the quieter options on the Chobe Riverside. Elizabeth Taylor and Richard Burton spent a five-week honeymoon here decades ago, and many more have found a love for the bush while celebrating their marriages. Note that the western side is quieter, with fewer vehicles vying for entry at the gates at dawn. The luxurious “floating boutique hotels” or houseboats on the Chobe also appeal to many; drifting in the currents and savouring the stars from the deck are lovely experiences. Honeymooners and couples seeking romance should also look at the size of the camps and lodges – often the smaller they are, the more intimate the experience. They will also probably prefer to avoid the more family-friendly establishments, but even camps that cater to both markets will ensure the honeymoon suite or tent is suitably located in the quietest area. Getting to Savuti in a bean-sized Cessna 206 is part of the fun. It’s a raw and wild place that will satisfy newcomers and old hands alike. Now that Nogatsaa has a spacious camp too, couples who are seeking peace and wilderness as much as wildlife viewing (although that’s perfectly possible) can consider this less-utilized area too. If the honeymooners are in a position to splurge, they will find excellent accommodations, perfectly appointed with the highest standards of service and dining. Some will have extra romantic activities, such as “star beds”: sleep-outs in fine linen under the enormous sky, bathed only in mosquito nets and moonlight. Exclusivity is assured in private concessions in Linyanti and Selinda, outside the park, and yes, there is nothing like a scrum of vehicles at a sighting to lower the romance factor. Not all couples want petal-strewn beds and perfumed baths. Many enjoy the experience of being out in the wilds and will forgo the trappings of electricity and formal plumbing in favour of being surrounded by the night’s chirps and roars, in the middle of the wilderness. Authentic tented mobile safaris also hark to the romance of bygone eras, when getting away from it all really meant leaving the world behind in favour of flickering firelight and freedom of movement. Independent camping is also possible in Chobe’s three public campsites, and equipment and vehicles can be hired in Maun and Kasane. Being on the road alone is something many couples relish; both partners should however know what to do in the unlikely event of an emergency. Guided specialist mobile safaris are the preferred alternative for extra creature comforts and peace of mind. Couples can team up with like-minded people on such adventures, small groups will be formed for set-date departures. Of course a private guided safari is the most exclusive alternative, but costly. PS: Overland safari adventures, which involve travelling long distances in relatively large groups in a heavy duty vehicle and often participating in camp and meal preparation, definitely ticks the adventure box rather than the romance box for most. If prepped and there is the staff available, some camps will provide a private game drive vehicle and guide at a price, but generally, the small groups in safari vehicles are good company and not intrusive. Travel to an unknown destination can be testing for anyone, and especially for new couples. Don’t be too ambitious; striking out alone is not for everyone and takes real preparation.